Ned is an introverted turtle who has always longed to study butterflies in a meadow across the forest. On the day he does, he meets Rosco, an extroverted puppy. Through their adventures, they find their differences are at times irritating but in the end beneficial to both. This is a story about human personality and how two friends learn to appreciate and respect their differing gifts. Ned and Rosco want to help people of all ages have fun exploring human personality. For example, did you know that introverted turtles like Ned tend to become specialists (brain surgeons) in their careers and prefer dark cozy spaces? Whereas, extroverted puppies like Rosco, tend to become generalists (corporate executives) in their careers and prefer light open spaces. If you share their passion for personality, you’ll love 2bme (www.2bme.cc) where you can effortlessly learn more about personality while you work and play! At 2bme, you can type your personality, organize all your favorite web-based tools for communications, social media, news, and work, and create a private online desktop especially tailored to your unique personality. Ned and Rosco guarantee you’ll say WOWZAWEEZA LOLAPALOUZA! Don’t forget to tell us what you think. Great read for teachers and school counselors! The story has adorable characters that children will love. The story shows that even though we are different we can get along and work together. I used this book for a read aloud and my students loved it! The rich vocabulary and subject matter lead to lively in depth discussion. I highly recommend it! 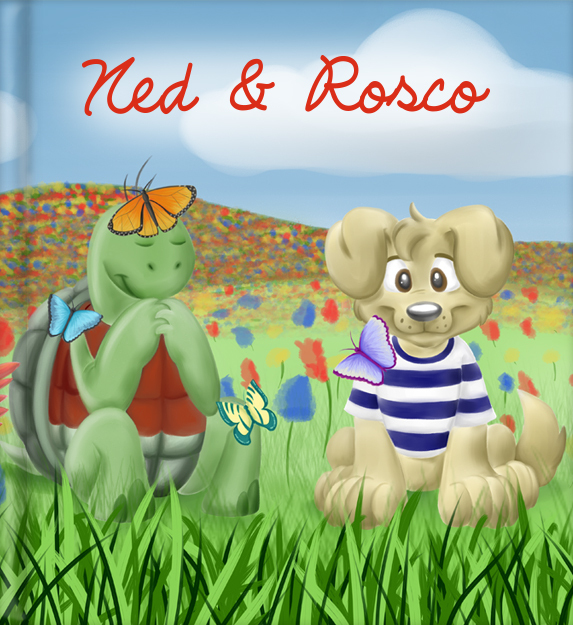 Ned & Rosco is the story of a turtle and a puppy, illustrated in bright, soft colors that are the most soothing I think I’ve seen since vacationing in the Caribbean. 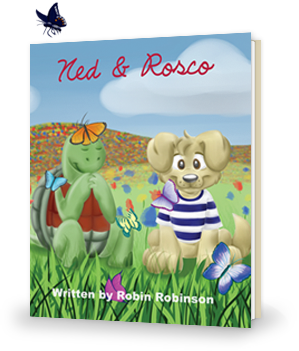 Ned & Rosco is the engaging story of a young turtle who leaves home to learn about the world. “Turtles need to understand life before they can properly live it.” Now here’s a great truth about experience, because it gives us someone else’s perspective, which leads to greater compassion, and a more fulfilling life. Young Ned had read about the meadow full of butterflies, and was full of facts about butterflies, but it wasn’t until Rosco came bounding into his life that Ned fully experienced the world of butterflies. Rosco is a puppy, and an extravert, so he does everything in his own energetic way which shocks Ned who is a quiet, book-reading introvert. There is a picture of Ned on one side of a page with Rosco on the other, which beautifully illustrates the two different perspectives that an introvert, and an extrovert see the world through. Rosco is all outward enthusiasm, while Ned is all seriousness, and inward contemplation. Ned sits in the meadow reading about the butterflies, while Rosco runs and plays with them, and suggests to Ned that if he wants to know about butterflies, he should just ask them himself. The author, Robin Robinson, lays out clearly and in an entertaining way, how we are all different from each other in the way that we learn about the world, but that there’s no ‘right or wrong’ way of doing things. And in fact, if we team up with people who learn differently that we do, we’ll increase our knowledge and wisdom exponentially. What is not to love about this book? Adorable characters, lessons about personality, and such a cute and entertaining story. There better be a second book! I want to find out what happens next with these two fun friends! Fabulous book that highlights and pays tribute to all personality types. I highly recommend this series for teachers and counselors to help children feel comfortable in their own skin and learn to respect the unique qualities that make us who we are! Great read aloud for teachers with many opportunities for predicting, inferrencing, and extensions for science lessons. The story captures your attention with catchy repetitive phrases and adorable characters children love! Builds on themes of friendships and diversity! Beautifully illustrated by Kristin Carella, this 40-page book puts the story of Ned & Rosco in your hands to read and enjoy with children ages 3-8. Get in touch with the author of Ned & Rosco!